If you are on a slow connection, thanks for your patience while the full page loads below. In a brazen move, the FBI, which never honestly investigated the evidence in the Judi Bari bombing, has given notice that they intend to destroy the remaining evidence in the still unsolved attempted murder. Surviving plaintiff Darryl Cherney files an objection to the destruction of evidence and moves the court to order the FBI to preserve the evidence and either turn the it over to him for DNA testing and other forensic analysis, or to deliver it to a certified 3rd party for testing. The FBI objects, saying it wants to destroy the evidence and claiming that the remains of two bombs are "contraband" which can not be released to a private individual. The motion is set for hearing Sept. 8, 2010, in Federal Court in San Francisco before Magistrate Judge James Larson. A press conference follows the hearing and will be held in the plaza adjoining the San Francisco federal building at 450 Golden Gate Ave.
You can read the motion and supporting documents from the Legal Documents page. Following the 20th anniversary of the 1990 car bombing and attempted frame up of Earth First! organizers Judi Bari and Darryl Cherney, civil rights attorneys Dennis Cunningham and Ben Rosenfeld will argue a motion in San Francisco Federal Court, 450 Golden Gate at 9:30 am this Wednesday, Sept. 8 in Courtroom F, 15th Floor before Judge James Larson, to prevent the FBI from destroying two sets of bomb remnants. The motion asks that those remnants and other evidence to be turned over to Cherney or an agreed upon laboratory for DNA and other forensic testing to determine the identity of the bomber. A press conference on the plaza outside the Federal Building will follow the hearing. The case stems from the FBI and Oakland Police attempts to pin a political bombing on the victims rather than look for the terrorist who tried to kill Judi Bari by hiding a motion-triggered pipe bomb under the driver's seat of her Subaru station wagon. The explosion interrupted Bari and Cherney's musical roadshow in which they traveled to colleges to encourage people to participate in for the Redwood Summer campaign to stop the logging of ancient redwoods. They had pulled out of Oakland just before noon, heading to UC Santa Cruz to perform on that fateful May 24, 1990 when Bari's car exploded on Park Blvd. near MacArthur. Oakland police and FBI agents instantly declared Bari and Cherney the only suspects despite the fact that all of the physical evidence pointed at an assassination attempt and that they provided the FBI on the day of the bombing with a folder full of death threats targeting them. Bari (posthumously) and Cherney won a successful civil rights trial in 2002, in which the jury agreed that their First and Fourth Amendment rights had been violated when the FBI and OPD falsely arrested them and illegally searched their homes--all in order to discredit and silence them. The events took place in a highly charged year. A ballot initiative--Forests Forever (Proposition 130) on the November ballot-- would have banned clearcutting and preserved ancient forests among other proposed reforms. It was defeated by just over one percentage point in a major setback. The FBI, intent on framing Bari and Cherney, has never conducted a sincere investigation. It has failed even to analyze lifted fingerprints or to do DNA forensics. Cherney, however, has conducted his own investigation, collecting and analyzing evidence in pursuit of the bomber the FBI appears intent on hiding. "There is a logging truck's load of forensic evidence in this case," said Cherney. A letter taking credit for two bombings, including the bomb in Bari's car, signed "The Lord's Avenger," provided details on the design of another bomb that barely went off at the Louisiana Pacific sawmill in Cloverdale, CA two weeks before the car bombing, as well as details of the car bomb. The bomb in Cloverdale is nearly intact and could provide DNA and other forensic evidence that could identify the bomber. A jury awarded the two $4.4 million - in Bari's case, to her estate. Later, the parties settled for a total of $4 million, inclusive of attorney's fees. The parties also agreed that: (1) the FBI would return evidence to Oakland; (2) Oakland would turn over evidence to Cherney; (3) the parties would certify any disputes to the Court; and 4) that May 24, 1990 be proclaimed Judi Bari Day by the city of Oakland, which did, in fact, occur. On June 11, 2002, a federal jury returned a stunning verdict in favor of Judi Bari and Darryl Cherney in their landmark civil rights lawsuit against four FBI agents and three Oakland Police officers. The jury unanimously found that six of the seven FBI and OPD defendants tried to frame Judi and Darryl in an effort to crush Earth First! and chill participation in Redwood Summer. That was evident in the fact that 80% of the $4.4 million total damage award was for violation of their First Amendment rights to speak out and organize politically in defense of the forests. "The jury exonerated us," said Darryl Cherney. "They found the FBI to be the ones in violation of the law. The American public needs to understand that the FBI can't be trusted. Ten jurors got a good, hard look at the FBI and they didn't like what they saw." "It's really beyond our wildest dreams," said Darlene Comingore, Judi Bari's friend and executor of her estate who stood in for her as co-plaintiff in this suit. "We hope the FBI and Oakland and all the police forces out there that think they can violate people's rights and get away with it are listening because the people of the state of California and Oakland today said, 'No, you can't. You can't get away with it.' "
Lead attorney Dennis Cunningham said the message he hopes the verdict sends is that: "Ashcroft is doing precisely the wrong thing to abandon the (Levi) guidelines and let the FBI go after dissent with a free hand. It's clear that their intention is not about fighting terrorism, it's about suppressing dissent. That's what the FBI has always been about. Hopefully it will make Congress think twice about giving them a free hand." Please click here to continue reading this article, with more interpretation of the meaning and importance of the verdict by the media as well as by individual participants and observers, including one of the jurors. To search this website, type in the box one or more words that must appear on the page you're looking for and then click on the Google Search button. This website is dedicated to Judi Bari. Judi was a renowned environmental, labor and social justice leader. She organized nonviolent protests against destructive corporate logging of the redwood forests. She died of breast cancer on March 2, 1997. We invite you to explore this website, which is filled with information about Judi Bari and her case. You'll find articles and speeches by Judi herself, in writing as well as in audio files which you can listen to over the Internet. You'll find articles about Judi, and about her case against the FBI. You'll find books, tapes and CDs that you can order. There is a photo gallery with images from Judi's personal collection as well as police photos of her bombed car. There are legal documents filed in the federal lawsuit. There is a poetry page, and we invite new contributions. Note the Site Index in the left column of this page listing the main category index pages. Use the Search Page to look for particular words or phrases, but note that the very latest additions to the site may not yet have been indexed by Google.com, which provides the search capability. Judi Bari was nearly killed in a still-unsolved terrorist attack on May 24, 1990, when a motion-triggered pipe bomb wrapped with nails exploded directly under her driver's seat. She and Darryl Cherney were driving through Oakland, California when the bomb exploded. They were on a concert and speaking tour to recruit college students for Redwood Summer, a campaign of nonviolent mass protests against corporate liquidation logging. Judi was maimed and disabled by the bombing, while Darryl received lesser injuries. In the previous two months, both had received numerous death threats from timber industry supporters and had reported them to local police. They had copies of written death threats in the car, where investigators found them. Right away, Judi and Darryl told paramedics and police officers that they had been bombed because of their activism against the timber industry, and both of them separately named the same individuals and a right-wing group that they believed were behind the bombing. But instead of investigating the bombing as attempted murder, as the evidence clearly showed, the FBI, with the willing collaboration of the Oakland Police, tried to frame Judi and Darryl for the bombing, further victimizing them by false arrest and accusing them of knowingly transporting the bomb that nearly killed them. It was a deliberate, politically motivated effort to target and "neutralize" Judi, Darryl and Earth First!, and to discourage people from traveling from all over the nation to join in Redwood Summer. The sensational false charges made headlines nationwide, and the FBI and their Oakland Police accomplices kept a two-month media smear campaign going with a series of false claims about physical evidence linking Judi to building the bomb. But after delaying arraignment for seven weeks, when it was finally time for the District Attorney to present evidence in court and file formal charges, the FBI and Oakland Police didn't actually have any. The D.A. announced he would not file charges, citing the lack of evidence. The Oakland Police closed their "investigation," but the FBI continued theirs, telling the media that Judi and Darryl were their only suspects. The FBI then used the pretext of investigating the bombing as cover for a nationwide investigation of Earth First!, sending agents to create dossiers on over 500 people whose only crime was to have received a long-distance phone call from Judi, Darryl, or one of 14 other people associated with them. A year after the bombing, when it was clear that the FBI and OPD were making no genuine effort to solve the bombing, Judi and Darryl filed a federal civil rights suit against the FBI and OPD. The suit claims false arrest and unlawful search in violation of the Fourth Amendment to the U.S. Constitution. It also claims a politically-motivated conspiracy in violation of the First Amendment which attempted to suppress and chill their free speech by discrediting them in public perception as violent extremists. covered up their own wrongdoing and obstruction of justice. To this day the FBI has never retracted the false charges or apologized. The FBI's sustained propaganda campaign against Judi, Darryl and Earth First! succeeded in fooling some people into believing they were bomb-using extremists. The lawsuit was delayed from coming to trial for nearly 11 years by defense motions and appeals intended to wear the plaintiffs down and prevent the case from ever coming to trial. They gained an immense advantage when Judi died in 1997, but Judi's estate, Darryl Cherney, their legal team and supporters have have kept the suit alive and have cleared every hurdle and won every appeal. The courts ruled several times prior to trial that there is substantial evidence to support the charges. The evidence was presented in a jury trial that began on April 8, 2002, and ended June 11 with a stunning vindication of Judi and Darryl, and a $4.4 million award of damages. A full 80% of the damages were for First Amendment violations, showing that the jury understood that the motivation for the false arrest and illegal searches was to interfere with Judi and Darryl's political activism with Earth First! in defense of the redwoods. In the left column of this page you'll find the latest information about the case, including the verdict form completed by the jury which details the verdict and damage awards. We hope you'll enjoy this website, bookmark this home page, and come back often to see what's new. Please scroll down and continue exploring this website. Twenty years ago on May 24, 1990, a bomb planted in the car of Earth First! activist Judi Bari exploded, sending her and fellow activist Darryl Cherney to the hospital in Oakland--Judi with life-threatening injuries, since the bomb had been hidden directly under her driver's seat. Judi and Darryl were on their way to a music and speaking event on the UC Santa Cruz campus, part of an organizing tour for Redwood Summer. That explosion, and the subsequent attack on Earth First! as well as Judi and Darryl by the FBI and Oakland police, would forever change the face of forest activism in the redwoods and elsewhere. The bomber was never found, because the FBI never conducted a serious investigation, choosing instead to blame and harass Earth First! activists. But a lawsuit filed by Judi against the FBI for violation of Constitutional rights was ultimately successful in 2002, vindicating Darryl and Judi, but coming five years after Judi's untimely death from breast cancer at the age of 47. Redwood Summer, 1990, was a mass mobilization of students and others from across the United States to protest the deforestation of the redwood region in Northern California, which was being decimated by the corporate chain saw. The mobilization was modeled after Mississippi Summer, a major organizing effort in the nation's civil rights movement in the South in the 1960s. A key architect and organizer of Redwood Summer was labor and environmental leader Judi Bari. The bomb which nearly killed her was preceded and followed by a smear campaign against Earth First!, carried out by the FBI, which tried to charge Darryl and Judi for the bombing, and tried to brand the deep ecology group Earth First! as a terrorist organization. The event included a film tribute to Judi, exciting historical exhibit and much more. Marking the moment: To mark the moment of the late morning bomb explosion, people from near and far gathered at 11:30 am at the Oakland site where the bomb blasted through Judi's car, nearly killing her and forever changing the Earth First! movement. The site is in front of Oakland High School, on Park Blvd near East 33rd. There was music and a speak-out. Cosponsors of these events include Earth First!, the Industrial Workers of the World (IWW) and the Bay Area Coalition for Headwaters (BACH). The Judi Bari Activist Grants are awarded biennially by the Redwood Justice Fund in collaboration with the Willits Environmental Center. The grants are funded from a portion of the damages awarded to the estate of Judi Bari in 2002, when a jury delivered a stunning verdict against the FBI and the Oakland Police Department in favor of Bari and Darryl Cherney. It was the culmination of an historic 11 year civil rights case. Naomi Wagner and Lindsey Holm, each in their unique ways, embody the spirit and passion that Judi Bari brought to environmental work. 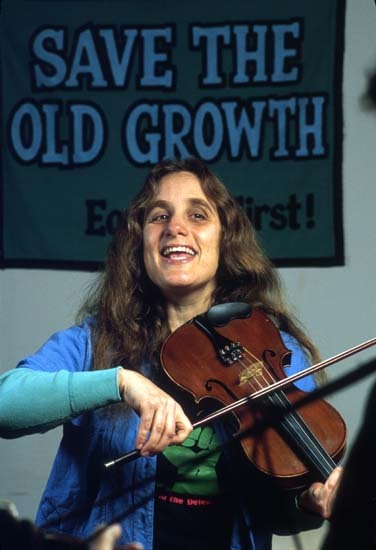 From 1988 until her death from breast cancer in 1997, Judi was a potent and charismatic force in the growing movement to stop the corporate liquidation logging of the redwood forests of Mendocino and Humboldt Counties. Judi was also the first forest activist to reach out to the loggers and mill workers in an effort to form an alliance with environmentalists to promote logging practices that would be sustainable for generations to come. A Willits resident, Judi was known and admired for her courage in facing hostility and danger, her boisterous sense of humor, her electrifying speaking style, and her powerful intellect. For two decades, Naomi Wagner has devoted her life to forest protection. In 1987 she walked into the Mendocino Environment Center seeking help to organize her neighborhood to fight abusive logging practices in the mountains west of Willits. She taught herself how to interpret official Timber Harvest Plan documents and learned how the public could influence them. Naomi enthusiastically joined Judi Bari and others working to reform abusive logging practices. Already a grandmother, Naomi became active in Earth First!, organizing and participating in nonviolent direct actions. The list of her involvement in forest defense reads like a history of the movement. She has been arrested, spent time in jail and endured a prolonged fast as expressions of her commitment to end non-sustainable logging practices on the North Coast. With her commitment to nonviolence and her rich experience in direct action, Naomi has trained a new generation of activists in the principles of effective action. Asked her reaction to receiving the grant, Naomi said, "I feel very honored for the recognition, but I'm also very aware of the hundreds and actually thousands of others who share the honor because we walk in Judi Bari's footsteps in working together to defend the forest against the corporations." Twenty-two year old Lindsey Holm was born and raised in northern Humboldt County. Her childhood in the woods led her to become an expert amateur mycologist, which in turn propelled her into defending the old-growth forests of her region. Lindsey was among a group of tree-sitters attempting to save the ancient redwoods of Freshwater Creek near Eureka. When she and others were forcibly extracted from the trees and arrested, she taught herself the law, defended their actions in court, and, without lawyers, won a settlement agreement. Lindsey has become skilled in reviewing Timber Harvest Plans, becoming familiar with the specialties of hydrology, geology and forestry as well as the statutory and regulatory aspects of logging plans. She has recently learned GIS and mapping techniques, and is about to embark on a year-long walk through the redwood bioregion guiding professional photographers to document the condition of this still-threatened ecosystem. Lindsey has demonstrated a voracious intellect, a matching appetite for hard work and a fierce drive to see justice done. And she’s just getting started! The Redwood Justice Fund and the Willits Environmental Center are proud to honor the memory of Judi Bari and encourage the work of these two exceptional women, Naomi Wagner and Lindsey Holm, by awarding these grants. The public is invited to attend the Saturday, June 16 celebration. Earth First! leader Judi Bari was nearly killed on May 24, 1990, when a motion-triggered bomb hidden under the driver's seat exploded under her in Oakland. Judi and Darryl Cherney, also an Earth First! organizer, were traveling to promote Redwood Summer, a nonviolent campaign to defend the redwood forests from corporate liquidation logging. Judi had received death threats from timber industry supporters, and had reported them to police. But even as Judi was undergoing emergency surgery for her horrific bomb injuries, the Oakland Police, at the instigation of the FBI, arrested the pair, falsely charging that they were terrorists who were knowingly carrying explosives. It was a deliberate frame-up, as a federal jury would find twelve years later. For nearly two months after the bomb attack, the FBI and Oakland police subjected Judi, Darryl and the Earth First! movement to a calculated media smear campaign intended to discredit them and neutralize their logging reform work. Eventually the prosecutor announced no criminal charges would be filed against them because there was no evidence they were guilty. Neither the FBI nor OPD ever pursued numerous clues or made any genuine effort to catch the real bomber, but continued to tell media that Judi and Darryl were their only suspects. Despite the injuries that left Judi crippled for life, the pair filed a federal civil rights lawsuit to defend themselves and their movement against unlawful governmental interference with their First Amendment right to organize politically in defense of the forests. Five years after Judi's untimely death, a federal jury vindicated her and Darryl, awarding them an unprecedented $4.4 million from the FBI and OPD, with fully 80% of the damage award for First Amendment violations and the rest for false arrest and unlawful search and seizure. March 2, 2007 was the tenth anniversary of Judi Bari's passing on March 2, 1997. There was a memorial gathering in Albion CA to mark the date and honor Judi's memory. The award-winning documentary The Forest For The Trees was shown for the first time on the Mendocino Coast. The film focused on the trial in Judi's 12 year lawsuit against the FBI and Oakland Police to clear her name of false charges of knowingly carrying a bomb that nearly killed her when it exploded under her driver's seat. Judi's close friend Alicia Littletree was there to sing a few songs and start a round of spontaneous story telling about Judi. One person drove all the way from the San Francisco Bay area for the event, and drove four hours back afterwards to go to work the next morning. There were displays of photos, banners and other memorabilia of Judi and the Enchanted Meadow uprising. The evening concluded with a showing of Kay Rudin's video tribute Viva Judi Bari. About 60 people attended the event at the Albion School, a good turnout for a rural area with a small and widely scattered population, and many competing events scheduled the same night. The Albion Nation has had a special affinity for Judi since she answered the community's call for help in 1992 when Louisiana Pacific Corporation began logging the redwood forest next to the estuary of the Albion River at a place called the Enchanted Meadow. Judi helped the community stage two months of nonviolent protests to slow the logging and call public attention to it. Tactics included over a dozen treesits, locking down to logging road gates and equipment and blocking bulldozers. After two months, an appeals court order shut down the logging as unlawful, validating the community effort to stop it. The Redwood Justice Fund and the Willits Environmental Center are pleased to announce the establishment of the “Judi Bari Activist Grant.” This $5,000 cash grant will be awarded biannually to a North Coast environmental activist working on the front lines in the “Judi Bari” tradition. It is intended to allow the recipient to continue working on behalf of the environment, and to encourage activists to follow in Judi’s footsteps. The first grant will be awarded in May, 2007. We are currently soliciting nominations from environmental groups and organizations throughout the North Coast. Nominees should be individuals who embody the qualities we so admired in Judi, and will be evaluated based on the presence of those qualities, as well as financial need. In this half-hour Radio Curious interview by Barry Vogel, Judi gives a brilliant analysis of how Texas corporate raider Charles Hurwitz took over Pacific Lumber with the help of junk-bond king and convicted felon Michael Milken. Judi tells how Hurwitz then began liquidating the largest remaining unprotected old-growth redwood stands in the world while using financial trickery to line his own pockets to the tune of hundreds of millions of dollars. Read more and listen to the interview from our Audio page. 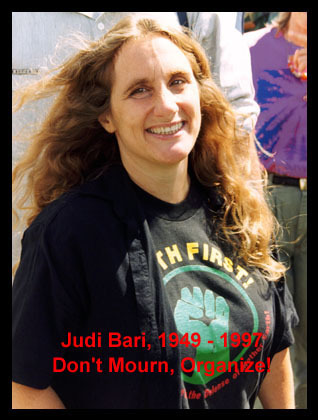 Listen to BBC Radio's documentary: "Don't Mourn, Organize: The Judi Bari Story"
BBC Radio broadcast a half-hour Judi Bari documentary in December 2004. The program can now be streamed or downloaded from our Audio page. The brilliant Bari/Cherney legal team took on and won the federal civil rights suit brought by non-violent Headwaters Forest protesters who had pepper spray soaked Q-tips put into their eyes by Humboldt County sheriff's deputies in 1997. You may remember the shocking police videos that drew international outrage and condemnation when they were broadcast by network TV. The forest activists sued in federal court for violation of their 4th Amendment rights by excessive force. There was an evenly split jury in their 1998 San Francisco federal court trial, in which they were represented by a different legal team. Instead of setting a new trial, the judge threw the case out, ruling that no reasonable juror could find that excessive force was used, even though half of the jurors had decided exactly that. The activists appealed, and the 9th Circuit strongly overturned the trial judge and granted a new trial. Defendants then appealed to the U.S. Supreme Court, which upheld the 9th Circuit decision. The Secret Wars of Judi Bari: A Car Bomb, The Fight for the Redwoods, and the End of Earth First! by Berkeley freelance writer Kate Coleman is a paid-for hatchet-job. The sham biography was published in January 2005 by Encounter Books, a non-profit "conservative" publisher which serves as the propaganda publishing arm of the ultra-right-wing Lynde and Harry Bradley Foundation. The book, filled with literally hundreds of lies and factual errors, is an effort to discredit Judi posthumously because she is a progressive role model, a strong woman who stood up to corporate power. Encounter Books has also published smear books on Hillary Clinton and Noam Chomsky, as well as books lauding right-wing heroes like Supreme Court Justice Clarence Thomas and McCarthy era anti-communist icon Bishop Fulton J. Sheen. Before starting Encounter books, the Bradley Foundation directly funded hundreds of right-wing books, including the original trash-for-cash smear book, The Real Anita Hill by David Brock, who has since had a change of heart and confessed that the book was almost entirely false and that he was hired and paid to write it. Like Brock, Kate Coleman has publicly admitted that she was recruited and paid to write her book, in which she attempts to discredit Judi, Earth First! and the whole radical environmental movement. Although she pretends to be a progressive and cites her participation in Berkeley's Free Speech Movement of the early 1960s, Coleman's more recent track record includes articles smearing Black Panther party leaders in right-wing publications put out by David Horowitz, the well-known former leftist turned hard-right propagandist, editor and TV pundit. Coleman was hired to write this attack book on the basis of an article she wrote for the Anderson Valley Advertiser, a paper whose then-editor, Bruce Anderson, carried on a famous print vendetta against Judi ever since she quit writing for his paper in 1993 and denounced him as a sexist bully. Secret Wars is Coleman's first effort at writing a book. Judging from the book it should also be her last. Some of Judi's friends and family have looked at Coleman's book and put together a list of over 350 factual errors and outright lies it contains, nearly two for every page of text. For a detailed rebuttal of the book and to see the lie list, please visit www.colemanhoax.info (opens in a new window). A new support group, Friends of Judi Bari (FOJB), has been formed specifically to defend Judi from this kind of malicious smear attack. You can learn more at the FOJB website, www.fojb.org (opens in a new window). Darlene Comingore, executor of the estate of Judi Bari, sent a letter to Encounter Books asking that they withdraw Coleman's book until the hundreds of errors it contains have been corrected. The text of the letter is below. Update: As of May 2006, Encounter Books has relocated to New York City, and Collier has been replaced by a new publisher. Encounter has not withdrawn Coleman's book, but there has been no visible promotion for it in nearly a year, and the book seems to have died a richly deserved death. The book's Amazon sales rank on 5/10/06 stood at 587,852 despite a recent price cut. That means 587,851 other titles are selling better, making the Coleman book one of the worst sellers. As of June 7, 2007 the book's sales rank had slipped to a new record low at 873,824th place among books sold by Amazon. RE: Request for withdrawal of "The Secret Wars of Judi Bari"
Regardless of political allegiances, it is sometimes possible for people of differing persuasions to agree that something just isn’t true. Although you run an ideologically-based publishing house, I trust that you have the intellectual integrity to want to avoid knowingly printing false information under the guise of non-fiction. Any book can have a few mistakes. But Encounter Books’ recent title, "The Secret Wars of Judi Bari," seems to have broken some kind of record. A page-by-page listing of its factual errors and false assertions has reached 351 entries, and the book is only 232 pages long. These errors range from small ones­like the constant misplacing of people, dates and events­on up to serious libels, like the claim that Bari abandoned environmental activism and instead promoted her image as a martyr in order to benefit financially. You may quarrel with some of the listings, but most are indisputable. Fifteen key errors are refuted with on-line documentation, and many more will be included in the "Instant Proof" section as additional documents are assembled. As someone who was a friend, political colleague, and ally with Judi from 1979 to the day of her death in 1997, the portrait painted in this book is not one that I recognize. Please don't take my word for this. In his LA Times review of your book published January 25, 2005, Mr. Mark Hertsgaard writes, "‘The Secret Wars of Judi Bari’ could be assigned in journalism schools to teach how not to do investigative reporting." As a person who Judi named to protect her interests, Ms. Coleman neither contacted me nor to my knowledge attempted to contact me to verify any assertions she presented in her book. A book can't claim to be a biography with this level of error, whether it is deliberate or just the consequence of a lazy author or incompetent fact-checkers. That doesn't mean that Judi Bari is above criticism. But everyone­dead or alive­is entitled to a certain base-line honesty in the telling of the story of his or her life. For these reasons, the Estate of Judi Bari requests that you withdraw "The Secret Wars of Judi Bari" from publication until it can be corrected. The extensive critique that has been posted by her family, friends and associates at www.colemanhoax.info should be helpful. I look forward to hearing from you. You may contact me by phone at --------, by email at ---------, or in writing in care of my attorney Mr. Daryl J. Weinroth, Esq., 750 Grant Avenue, Suite 250, Novato, CA 94947. A fourteen-year saga ended on Friday, May 7, as the FBI joined the City of Oakland in paying Earth First! activists Darryl Cherney and the late Judi Bari through her estate a combined $4 million for violations of their first and fourth amendment rights as guaranteed by the U.S. Constitution. The lawsuit stemmed from a May 24, 1990 car bombing of the pair. The FBI and Oakland police instantly blamed Bari and Cherney for bombing themselves even though they had conducted no investigation and all evidence collected showed they were the victims of an assassination attempt. A ten-person jury in Judge Claudia Wilken's Federal District Courtroom in Oakland originally awarded Bari and Cherney $4.4 million, but a post-trial contractual agreement was engineered to avoid appeals by both sides. Attorney Dennis Cunningham led the legal team of Bob Bloom, Tony Serra, William Simpich and Ben Rosenfeld, all of the SF bay area. Fee attorney James Wheaton of the First Amendment Project joined post-trial efforts to draft a fee motion, which if it prevailed, could have doubled the amount the defendants would have had to pay, setting legal precedents the FBI wanted to avoid and Oakland could not afford. Numerous other post trial motions and pending appeals were all dropped by all sides to conclude the case. But when the dust cleared, the jury verdict remained in place. For one of the only too rare times in history, the citizens of the United States scored a victory for civil rights over the scandal plagued, notorious Federal Bureau of Investigation. Alicia Littletree, who lived with Judi Bari and was considered to be her protégé, was dubbed the "Most Valuable Paralegal" by all involved. "Our lawyers were the only legal team that could have pulled this off. They were geniuses," she said. When asked how Judi might react to the victory, Littletree said, "Judi wouldn't have gotten over the feeling that the bombing is not solved. That is a lingering part of the fight. Judi wouldn't give up just because the money came in." She added about the settlement, "It's an easy way out for the FBI." Cherney vowed to continue the investigation of the bombing. Included in the post-trial victory settlement, Cherney achieved the return of all evidence in the case. He was also able to convince the Oakland City Council to proclaim May 24 to be "Judi Bari Day. " Plans are still being formulated for victory celebrations up and down the coast of California. Cherney said that no individual involved with this case would net more than $500 thousand dollars. When asked how he will spend the funds, he replied, "Acquire a modest home, help fund a continued investigation of the bombing, donate to worthy groups, and channel energy into producing CD's of eco-music." Cherney and Bari were bombed on their way to a musical performance that doubled as an organizing drive for a campaign called Redwood Summer 1990. Bari played fiddle, Cherney guitar, and they both sang and wrote songs. Attorney Bob Bloom said, "If we get a few more victories like this, it might affect what the FBI, the domestic army of the United States, does to people." Cherney added, "In the wake of 9/11 and Bush's assault on our civil rights, our trial victory is more urgent then ever. We the people will not stand for the FBI or any government agency clearcutting the constitution. May a thousand lawsuits bloom from this one to hold the FBI accountable for their too-many-to-count violations of the laws they are supposed to uphold." The mayor and city council of Arcata, California this week proclaimed November 7th as the city's annual Judi Bari Day, honoring the late environmental and social justice activist on her birthday. Arcata Mayor Bob Ornelas, in an interview on KMUD News this evening, said he had long admired Bari and was happy to sign the proclamation honoring her. "Judi Bari really was a special person -- very effective," Ornelas said. "She came from a labor background. She understood the challenge of trying to work in the woods and leave it in a better condition then when you got there." Ornelas said Bari and Cherney "really brought redwoods to the forefront [of public awareness] with Redwood Summer and those kinds of activities." The mayor added that support for the Judi Bari Day proclamation by the council was unanimous. "I'm not aware of any level of protest in the community -- well maybe later in the week by some of the right-wing radio stations." Arcata, on Humboldt Bay a few miles north of Eureka, is home to Humboldt State University. Humboldt County's economy has for over a century been dominated by the redwood logging industry, and is still the scene of heated controversy over the continued logging of the few old-growth redwood forests left in the world by Maxxam Corporation-owned Pacific Lumber Company. Arcata joins the City of Oakland, California in designating an annual Judi Bari day. Acting earlier this year, Oakland chose to honor Bari on May 24, the date she was severely injured by a car bomb explosion under her seat in 1990 as she drove through that city while organizing an environmental campaign. Bari died on March 2, 1997 of breast cancer at the age of 47. Last year a federal jury found several FBI agents and Oakland police officers liable for $4.4 million for violating the First and Fourth Amendment rights of Bari and fellow Earth First! activist Darryl Cherney by falsely arresting them for the bombing, unlawfully searching their property, and conducting a media smear campaign aimed at destroying their credibility and effectiveness as environmental and political organizers. Negotiations have been under way for months in an effort to work out a post-trial settlement that would avoid the additional expense and delay of appeals by both sides in the federal case. Whereas, prominent environmental activist David Brower stated on the occasion of her untimely death on March 2, 1997 from cancer at the age of 47, "Judi always projected an unwavering commitment to her values and her continued urgings to affect apathy into action. We will miss her commitment and compassion, her strength, courage and conviction. We can honor her by sharing it." media, festivals, school assignments and other creative means. Our excellent legal team has just won the prestigious Trial Lawyer of the Year award for 2003 for its work on the Bari vs. FBI case. Our team shared the award with another legal team who won a large settlement reforming working and living conditions for sweatshop workers overseas. Solo practitioners Dennis Cunningham, J. Tony Serra, Robert Bloom and Ben Rosenfeld of San Francisco, and William A. Simpich of Oakland, California, along with William H. Goodman of Moore & Goodman in New York and Michael E. Deutsch of The People's Law Office in Chicago received the nationally prestigious award from The Trial Lawyers for Public Justice (TLPJ) Foundation at its 21st Anniversary Gala on July 22, 2003, for winning a rare $4.4 million jury verdict in Estate of Judi Bari v. Doyle against the Federal Bureau of Investigation (FBI) and the City of Oakland for violating the civil rights of two environmental activists during a 1990 bomb investigation. This award is bestowed annually upon the trial lawyer or lawyers who have made the greatest contribution to the public interest by trying or settling a precedent-setting case. It is the nation's single most prestigious award for trial lawyers. "These exceptional attorneys offer powerful examples of how trial lawyers play a crucial role in exposing and redressing government intrusion and corporate misconduct," said outgoing Foundation President Paul Stritmatter of Stritmatter Kessler Whelan Withey Coluccio in Hoquiam, Washington. "We are proud to honor them for their exemplary work defending the Constitution and protecting workers' rights." In Estate of Judi Bari v. Doyle the jury found that both the FBI and the City had violated the First and Fourth Amendment rights of Earth First! activists Judi Bari and Darryl Cherney, under the false cover of a "terrorist" investigation. The verdict in this case sends a strong, cautionary message about the value of our constitutional rights and the abuse of law enforcement power in the name of national security. You can read the full July 28, 2003 press release from TLPJ announcing the award winners and other nominees. It's all the more impressive that our team won when you see the kind and importance of cases won by the other nominees. Go team! Congratulations! Viva Judi Bari!!! Legal teamers Ben Rosenfeld and Dennis Cunningham wrote a new article about the case for the Fall 2002 issue of NLG Practitioner, the legal journal of the National Lawyers Guild. It begins with a brief case overview, then, in the authors' words: "use(s) the case as a lens to explore a number of key challenges in civil rights litigation which we wrestled with, in order to aid fellow activists and attorneys in winning more 'people’s victories.' While we offer it as a law review article, we have not cluttered it with legal citations, in hopes that it will be accessible to attorneys and non-attorneys alike." The Women on Wednesday talk show included an approximately 1 hr. segment with Mary Nunn. We have split it into two MP3 files. The KMUD News interview with Mary runs about 11.5 min., and is a separate MP3 file. For more information on how to listen to these files please see our Audio index page. An in-depth interview with Bari vs. FBI trial juror Mary Nunn has just been published online by the Albion Monitor. Following are a few excerpts. Monitor: You are the only juror who is willing to talk about your experience. Monitor: Did you think the police and FBI witnesses were lying in court? Monitor: Eighty percent of the total damage award was for First Amendment violations. How did the defendants violate the First Amendment rights? What acts did they do? Nunn: One that really touched me was the nightly TV news spots that (OPD Lt. Michael) Sims delivered, smearing their name. It was just character assassination. It was just horrible. Sending that all over the Bay Area and who knows where else. "These are bombers. There are no other suspects. Our primary focus is on these two." It was horrifying. How do you rebound from that? They lost their ballot Proposition 130 that year, not to mention the trees. They lost their face in society. Judi's kids were teased and taunted at school. They had to walk around in fear, never knowing where this crazy bomber is at. Monitor: Did you feel the defendants deliberately framed Judi and Darryl? July 3, 2002 -- Three weeks after they ordered Oakland police and the FBI to pay Earth First organizers $4.4 million, jurors were allowed to speak for the first time Tuesday, and one of them said "investigators were lying so much it was insulting." "The FBI and Oakland (police) sat up there and lied about their investigation," said juror Mary Nunn of Oakley. "They messed up their investigation, and they had to lie again and again to try to cover up. I'm surprised that they seriously expected anyone would believe them." Please click here to continue reading three press articles reporting juror comments. OAKLAND, CA, Tuesday, June 11, 2002 — The jury in the Judi Bari and Darryl Cherney federal civil rights lawsuit against four FBI agents and three Oakland Police officers awarded plaintiffs $4.4 million for violation of the activists’ constitutional rights and returned a verdict largely in favor of Earth First! activists Cherney and the late Judi Bari. In a legal victory of historic proportions against the FBI, the jury found that six of the seven defendants violated the First and Fourth Amendments of the Constitution by arresting the activists, conducting searches of their homes, and carrying out a smear campaign in the press, calling Earth First! 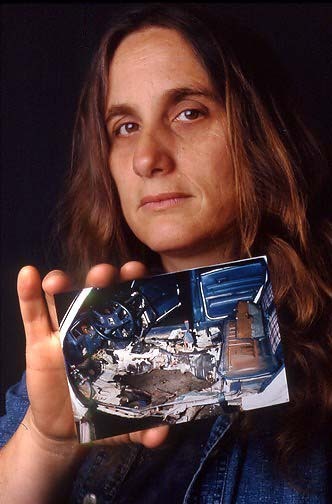 a terrorist organization and calling the activists bombers, in the aftermath of the explosion of a bomb that was planted in Judi Bari’s car in 1990. This verdict finds unlawful the actions of those in charge of the bombing investigation, and vindicates Bari and Cherney. FBI agents Frank Doyle, John Reikes, Philip Sena and OPD officer Mike Sims were found to have violated Bari and Cherney’s First Amendment rights. In addition, OPD officer Sitterud was found to have violated Cherney’s First Amendment rights. Doyle and Chenault were found to have violated Bari’s Fourth Amendment rights related to the search of her home, and Doyle and OPD officer Chenault were found to have violated Cherney’s Fourth Amendment rights. FBI agent Doyle and OPD officer Sims were found to have violated Bari’s Fourth Amendment rights in relation to her arrest. The jury returned an "undecided" verdict with respect to violations of Cherney’s Fourth Amendment rights for his arrest. Frank Doyle was the agent in charge of the 1990 bomb scene, and taught an FBI bomb school at a Louisiana Pacific clearcut a month prior to the bombing. Doyle was also the Squad 13 relief supervisor. Squad 13 was the joint terrorism squad made up of FBI and Oakland officers and collected extensive files on political groups in the Bay Area. Reikes was the head of the FBI’s terrorist squad who came to OPD headquarters the day of the bombing to give the inflammatory briefing on Earth First! Sena was already engaged in a secret investigation of Earth First! and concocted a fake informant tip. Sims was an OPD homicide lieutenant in charge of other officers investigating the bombing and the decision-maker for the unjust arrests of the activists. Sitterud ignored evidence at the scene and concocted information that would implicate the activists. Chenault wrote the first fraudulent search warrant affidavit. Over the last twelve years, thousands of people in Northern California and through out the country have supported Judi Bari in her fight for justice with the FBI and Oakland Police Department. That support has been in many forms. Standing up for and with her when she was accused of being a terrorist. Contributing money that allowed us to take this struggle to trial. Supporting her right to have her day in court when that right was challenged from many sides. Now after twelve years, a jury of working people found that the FBI and Oakland did a frame up job on Judi and that they did try to stop her work by knowingly and falsely accusing her of being a terrorist. Although this victory comes after her death and goes no where near complete justice, what we have won is critical. What we have won, besides clearing Judi’s name, is a sign that people are unwilling to trade freedom for so-called security. What we have won is a message to the FBI and police forces everywhere that if you violate the constitution you will be made to pay. What we have won is a basis with which to challenge the actions of the current administration’s efforts to rewrite the constitution, which would eliminate the requirement for evidence and proof before depriving someone of their freedom. As Judi’s close friend, political comrade, and the executor of her estate, I want to take this time to thank all of the people who have stood with us over these last twelve years. Your support was the reason we were able to force the FBI and Oakland to be accountable for their actions. Your support and action will help ensure that the constitution will be applied to all people in our country. My family is grateful to the jury and wants to thank them for their courageous decision. They have affirmed our faith in the justice system. We're only sorry that my sister Judi is no longer alive and able to share this sweet moment. Before and after my sister's bombing in 1990, law enforcement that we normally turn to for protection was not there for her. When the call went out over a Fort Bragg radio station to kill Judi Bari, no one stepped in to diffuse the situation. When she received even more death threats, the local police cold-heartedly dismissed her pleas for help. And after she was viciously bombed, the system failed her again. When her family and friends came to her side at the Oakland hospital, they found her critically hurt and in horrific, obscene pain. Yet Judi was also in a state of panic. Not only could she receive no police protection from the anonymous bomber who was still at-large, but the Oakland Police wanted to pull her from her room and place her in handcuffs in the hospital's prison ward for supposedly bombing herself. She suffered further indignities when she heard herself characterized as an eco-terrorist bomber by the news media, and when her house was publicly searched by the FBI as she lay helplessly in her hospital bed. Thereafter, she lived in constant pain and anxiety, and spent the rest of her life trying to clear her name. The ripple effect of a violent crime is enormous. When the authorities are against you rather than on your side, all the problems are magnified. Judi suffered, her two young children suffered, her family suffered, and her wider community of friends and supporters suffered. Now that the Oakland Police and the FBI have been brought to justice, they owe it to my family to explain what cause they had to hold my sister's civil rights in such contempt. Judi's political message was adamantly nonviolent. Yet, for 12 long years she has been wrongly connected with terrorism. After Sept. 11th and the threatening of many of our rights in the name of homeland security, I'm afraid that this scenario will occur more often. My family has seen up close how much harm can result when rights are ignored. In Judi's case, the authorities stepped outside the law, and yesterday they were found guilty of false arrest, defamation of character, and illegal search and seizure. The verdict reminds us that protection against terrorism should never outweigh the protection of our own civil rights. Otherwise, like my sister Judi Bari, we will be made to suffer the consequences. EF!J: With striking implications for the Earth First! and global justice movements, can you share your thoughts on what the verdict means to the movement’s future? DC: First of all, it means that the movement can fight back. We don’t have to take this crap from the FBI. I can tell you that the FBI probably finds nothing in the world more distasteful than to pay any activists in the Earth First! movement four-and-a-half million dollars. That, in and of itself, is very sweet. Now we haven’t exactly gotten that money yet, and it might be years before we see a penny, nevertheless the concept is probably driving the FBI up the wall. Secondly, it shows that Earth First! was targeted by the FBI, and that we are victims of FBI terrorism, as opposed to being terrorists ourselves. That the real terrorists are in government. This news is certified in the record, and the FBI is going to have to live with that no matter what. It also shows that 10 members of the American public can look at Earth First! and look at the FBI and OPD and make a decision that the Earth First! activists were trustworthy and that the police officers were not. Could a reasonable officer have believed that his conduct was lawful? An archive of BariNews bulletins sent to date can be found at the BariNews home page at Yahoo Groups. The Albion Monitor is an independent progressive Internet newspaper which has reported extensively about Judi Bari and the bombing case and trial. The link above opens the Monitor's Judi Bari Resources Index page in a new window. Once you're there, be sure to also visit the Monitor's front page by clicking on the Monitor logo at the top of the page. Several hundred people gathered for the annual noon rally in the courtyard of the Oakland Federal Building May 24, 2002, to mark the 12th anniversary of the car-bombing of Judi Bari and Darryl Cherney. The rally also celebrated the first annual Judi Bari Day, honoring the late environmental, labor and social justice organizer. The rally also celebrated the end of seven weeks of trial in Judi Bari and Darryl Cherney's historic federal civil rights suit against the FBI and Oakland police. Members of our legal team spoke, including Dennis Cunningham, Tony Serra, Bob Bloom, Bill Simpich, Ben Rosenfeld and Alicia Littletree. Folksinger Utah Phillips and fiddler Morgan Fichter hosted the rally, whose theme was "Fiddle Down the FBI," referring to the FBI seizing Judi's childhood fiddle as evidence and never giving it back. Musicians included Utah Phillips, Laurie Lewis, Darryl Cherney, Alicia Littletree and many more. Judi Bari deposition audio -- MP3 files taken from the audio track of her deposition videotape as shown in court at the end of trial in Bari vs. FBI, May 2002. Judi's sworn deposition was taken just a month before her death in order to preserve her testimony in a form admissible at trial. This is the depo that the FBI didn't want to happen. Their attorney Joe Sher threatened to delay it. When Judi's impending death from cancer was mentioned, Sher accused her of faking cancer. He used his threat of delay to coerce an agreement that the deposition could not be made public except whatever portions became part of the court record. He then objected to virtually every question asked of Judi by Dennis Cunningham, then objected to Judi's answers, interfering with their train of thought and the flow of the story. Judi was very ill and was lying on a couch propped up with pillows but she told her truth and got it on record. The two days of deposition were reduced to just 90 minutes of edited video shown to the jury, with all of Sher's objections edited out along with much of Judi's testimony. See below for the transcript of Judi's deposition. There are three MP3 files of approximately 30 min. each. which you can stream or download. Click here to go to the Audio Files page to access the files. Names and brief information about the plaintiffs, defendants, legal teams, witnesses and other names involved in the trial of Judi Bari and Darryl Cherney's civil rights suit against certain FBI agents and Oakland Police officers. It also lists the order in which witnesses have been called. This is the redacted (censored) version authorized by the court as a guide for editing the videotaped deposition shown to the jury at trial. This version maintains the official page and line numbering, but has been compressed from double spacing to single, and multiple pages per sheet. By a combination of the redaction and the layout compression, 281original pages have been reduced to a 53 page Adobe Acrobat file. Note that MP3 audio files of the deposition are also available on this website. The judge's official legal instructions to the jury and the filled in jury verdict form returned by the jury to report their verdict are available in Acrobat PDF format. Because these are graphic images of the pages rather than text, the files are fairly large, about 300 K each, but they have been optimized for rapid Web view, so if you have an up-to-date version of Acrobat Reader the first page will display very quickly, and you won't have to wait for the whole document to download before you can begin reading it. Once the file is fully downloaded you can save it to disk for future reference. Judge Wilken ruled that this information was irrelevant to the case against the individual defendants and barred it from being mentioned during the trial. This document was submitted to make an additional record for appeal. Our Judi Bari web photo gallery is now online for your enjoyment and information. Judi's 1996 Berkeley presentation of her case against the FBI. Hear Judi at her awesome peak, revealing her impish sense of humor, her intellect, and her amazing grasp of the case. Laugh while you learn the shocking facts in a way you'll remember. Alicia Littletree broadcast this program May 12, 2000 on KZYX/KZYZ Mendocino County Community Radio. Thanks, Alicia. Listen to a 4 min. audio clip from the CD "Who Bombed Judi Bari"
RSJP's four-page illustrated brochure included with the August 1999 mailing covers recent incidents of harassment of activists such as the firebombing of an Earth First! activist's van in Ohio, the pipe bombing of the Forest Guardians in New Mexico, new FBI investigation of EF! activist Darryl Cherney, harassment and investigation of activists at Headwaters Forest, Vail Colorado, and Minnehaha Minnesota, a disinformation campaign aimed at discrediting Judi Bari's case against the FBI, and more. Click here for the complete brochure as an Adobe Acrobat PDF file, complete with four photos, graphics and nice layout exactly as printed for the mailing. (Note: 260K download takes time but it's worth the wait. (Note: you need the Adobe Acrobat Reader installed on your computer to read this file. If you don't have it, please go to http://www.adobe.com/prodindex/acrobat/readstep.html for a free download of the latest version.). Report by Noelle Hanrahan in association with RSJP and included with the April 1998 update mailing. Judi Bari Dies But her Spirit Lives On. The June 9, 2002 Sunday San Francisco Chronicle contains a blockbuster special report titled The Campus Files - Reagan, Hoover and the UC Red Scare. The report fills an entire section of the newspaper, where the blurb says: "Secret FBI files show how the bureau's covert campaign to disrupt the Free Speech Movement and topple UC president Clark Kerr helped launch the political career of an actor named Ronald Reagan." Judge Claudia Wilken -- then a federal magistrate but later presiding over the Bari vs. FBI trial -- played a key role in the story when she ruled against the FBI and made them un-redact hundreds of pages of FBI files that had been provided to Chronicle writer Seth Rosenfeld, who fought a 17-year legal battle under FOIA to force the FBI to turn over more than 200,000 pages of files. Highly recommended! But don't go away yet; there's lots of good stuff to read here too. I was attracted to Earth First! because they were the only ones willing to put their bodies in front of the bulldozers and the chainsaws to save the trees. They were also funny, irreverent, and they played music. But it was the philosophy of Earth First! that ultimately won me over. This philosophy, known as biocentrism or deep ecology, states that the Earth is not just here for human consumption. All species have a right to exist for their own sake, and humans must learn to live in balance with the needs of nature, instead of trying to mold nature to fit the wants of humans. Judi Bari's life has ended much too soon. Seeing her work evolve over the years brought me continued hope and inspiration. Margaret Mead once wrote: “Never doubt that a small group of thoughtful, committed citizens can change the world, it's the only thing that ever does.” Judi's small stature belied her powers of influence, a bear in the forest confident and strong. Consistently an ardent defender of all remaining old-growth redwoods, Judi’s mantra remains the heart of the current Headwaters debate. Headwaters is a battle we can not afford to lose, if we let those who are intent upon felling the remaining unprotected redwood groves, the movement will have lost a historic opportunity to disable the forces threatening our natural heritage. The wilderness advocates, local community activists and labor forces who embraced Judi's call to action were moved by her disdain for senseless destruction. These sometime disparate constituencies have greatly aided our efforts, without compromising our goals. We must continue to strengthen those alliances and demand an unconditional sanctuary for all the remaining old-growth redwood forest ecosystems. Life on Earth is a precious and tenuous experience and times like these remind us of the importance to remain committed to that which is most meaningful in our lives. Judi always projected an unwavering commitment to her values, and her continued urgings to affect apathy into action. We will miss her commitment and compassion, her strength, courage and conviction. We can honor hers by sharing it. Over the years we have been warned about the danger of subversive organizations that would threaten our liberties, subvert our system, would encourage its members to take further illegal action to advance their views, organizations that would incite and promote violence, pitting one American group against another... There is an organization that does fit those descriptions, and it is the organization, the leadership of which has been most constant in its warning to us to be on guard against such harm. The [FBI] did all of those things. 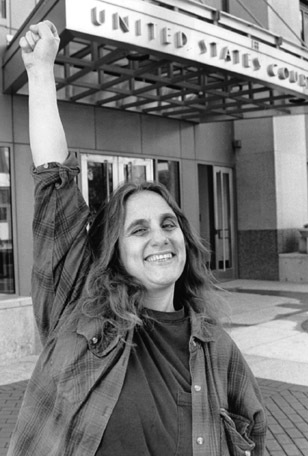 Judi Bari founded the nonprofit Redwood Justice Fund and its Redwood Summer Justice Project in 1991 to organize political and financial support for her lawsuit against the FBI and Oakland Police, which was finally won in 2002 and ultimately resolved in 2004. RSJP maintains this website as a resource for information about Judi Bari and an archive of her writings and speeches. For more information click here. Please consider a donation to support the development and maintenance of this website and the archiving of materials about or by Judi Bari. We accept secure online donations through Paypal. Just click on the PayPal logo below. We hope you enjoy your visit. Please bookmark this page and come back often. Please tell a friend about this website.